as newly transferred Tokyo Police Detective Kyochiro Kaga is assigned to a baffling murder. Detective Kyochiro Kaga of the Tokyo Police Department has just been transferred to a new precinct in the Nihonbashi area of Tokyo. Newly arrived, but with a great deal of experience, Kaga is promptly assigned to the team investigating the murder of a woman. But the more he investigates, the greater number of potential suspects emerges. It isn’t long before it seems nearly all the people living and working in the business district of Nihonbashi have a motive for murder. To prevent the murderer from eluding justice, Kaga must unravel all the secrets surrounding a complicated life. Buried somewhere in the woman’s past, in her family history, and the last few days of her life is the clue that will lead to the murderer. 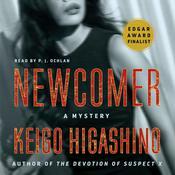 Keigo Higashino is the bestselling, best-known novelist in Japan and around Asia, with television and film adaptations of his work in several languages and many prestigious awards. He’s the author of The Devotion of Suspect X, the English translation of which was the finalist for the Edgar Award for best novel, and Salvation of a Saint.